You have waited long enough and here we have it. The double Gameweek has finally arrived and the headaches can truly begin. So, which Man City player are you triple captaining then? We’ve got all the chat around Sergio Aguero, Raheem Sterling as well as the possibility of a City defender or two. 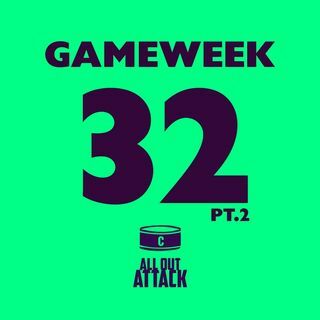 Nathan and Joe also touch upon chip strategy and whether or not Tottenham will rise to the occasion in their swanky new stadium when Crystal Palace roll in at the tail end of the Gameweek. The ... See More Fantasy Football Pundits team have also given us another perfect tip for the DGW32. Subscribe, give us as many stars as you can in the time it takes to decide your final starting 11 and follow us on Twitter at @AllOutAttackFPL. Thank you, enjoy and as always good luck in Gameweek 32.